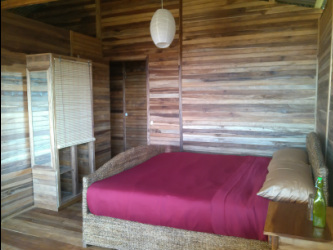 Our four spacious wooden chalets, nestling on the slopes of the hill which dominates Lake Nicaragua, offer you a calm and comfortable place to stay in an exceptional tropical setting. You will be continually seduced by her colours, her scents, and her songs. 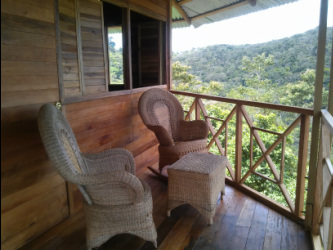 You will see humming-birds and toucans in the mornings and breathtaking sunsets in the evenings! You will be cooled by the gentle breeze off the lake and you will be able to relax in the hammocks we have put up for you. 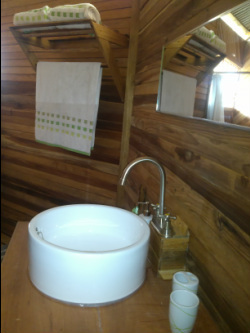 Built entirely of wood, they offer you a cozy and warm nest, natural and very pleasing to the eye. We'll provide you with environmentally friendly soaps and shampoos and other relaxation aids. There are three two-bedroom chalets which can accommodate from 1 to 5 people and a three-bedroom chalet which can hold up to seven people.